My kids grew up with Margaret Wise Brown for quiet, go-to-sleep, soothing bedtime stories. But when they wanted belly laughs, tales to memorize and repeat (and not necessarily go to sleep), they chose Sandra Boynton hands down. Her books are a constant in every baby book collection I give to new mom friends and relatives. In fact, I cannot imagine any starter book set without Moo, Baa, La La La!, The Going To Bed Book, Barnyard Dance!, Tickle Time! and Hippos Go Berserk! Now I’m delighted I can add a new fave, one of the Boynton on Board book series, to my gift list. The Bunny Rabbit Show! board book (Workman, $6.95, Ages 0-4), featuring an oval die cut cover revealing dancing rabbits, is as cute as can be. Boynton’s in top form here with a catchy rhyming refrain and a feel-good, entertaining performance by the happy hoppers. What Boynton does best is create her books at two levels; the first appealing to the youngest child being read to, and the the second appealing to the parents and care-givers who will surely be sharing the story over and over again. And why not? What’s not to love about a bunny board book featuring a bunch of bunnies (ten terrific rabbits to be precise) in a Rockettes-like line on stage singing, dancing and strutting their stuff. Add more to their listening and looking pleasure by asking, as you read, if your little ones can spot the cow, pig, duck and sheep in the audience for some guaranteed giggles. Maybe even pull out a pair of bunny ears so your child can join in the show! That’s a big part of what makes a Boynton book so very, very fun to read. It’s hard to keep them on the bookshelves. Enjoy! 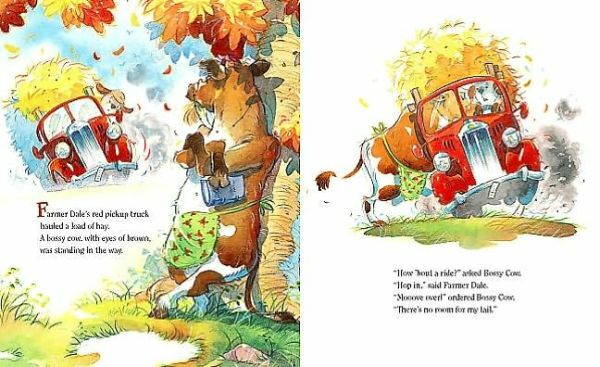 MaryAnne Locher reviews FARMER DALE’S RED PICKUP TRUCK (Houghton Mifflin Harcourt, $7.99, Ages 2 and up) . 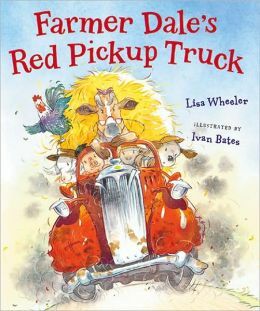 Farmer Dale’s Red Pickup Truck by Lisa Wheeler with illustrations by Ivan Bates, Houghton Mifflin Harcourt 2014. The truck bounced up. The springs all popped. The bumper bumped. The pickup stopped. The pickup bounced and shimmied. It groaned and squeaked and wheezed. and started with a sneeze. The rhyme in this book moved along perfectly, even when the pickup truck didn’t. The illustrations of the anthropomorphized animals were full of life. My favorite part of the book is the ending. Not because I want the book to be over, this is one I’ll read many times over, but because there are even more animals to see and Bates’s illustrations paint a picture worthy of another story. Interior images from Farmer Dale’s Red Pickup Truck by Lisa Wheeler with illustrations by Ivan Bates, Houghton Mifflin Harcourt, © 2014.